Our logo has become known all over Austria but in the last couple of months we learned the similarities with another brand were too big. Time for change has come. After many brainstormings, focus groups, nights with Redbull and many without, we finally got it. 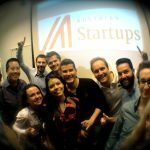 The new AustrianStartups logo.